The short answer is yes you can! 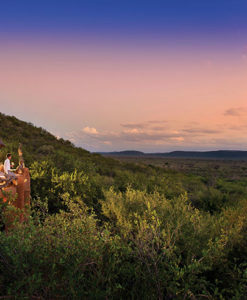 A safari can be an incredible, fun and never-to-be-forgotten family vacation. With that in mind, there are some things to take into consideration when planning a safari trip with young kids. Africa offers spectacular safaris in several countries, including South Africa, Zambia, Botswana, Namibia, Malawi, Zimbabwe, Kenya, and Tanzania. But individual countries are more suitable than others when it comes to bringing your kids along. South Africa, in particular, is the perfect location for a safari with children, as it’s home to some tremendous malaria-free reserves with lodges that cater specifically to youngsters. It is also likely to be the best-value safari you’ll find for families of 3 and up. Top malaria-free reserves for families include Madikwe and Pilanesberg in the North West, Sanbona in the Western Cape and Shamwari in the Eastern Cape. Sanbona is particularly suitable for young kids as it’s just 3 hours from Cape Town, allowing you to add this beautiful city to your itinerary without too much traveling (and long drives) in between. Pilanesberg is also great for this reason, with a 2-3 hour drive from Johannesburg, the biggest hub for connecting to other parts of the country and continent. Destinations like the Masai Mara in Kenya and the Serengeti in Tanzania can be genuinely unforgettable holidays for kids, but you will have to take malaria precautions in these places. Avoid places like the Okavango Delta in Botswana with young children – certain safety risks here make it a less desirable location for kids younger than 12. 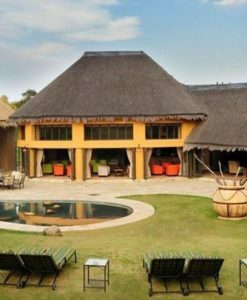 If in doubt, choose a lodge that explicitly advertises itself as family friendly, and even better if it has a dedicated kids club and safari programme for little ones. 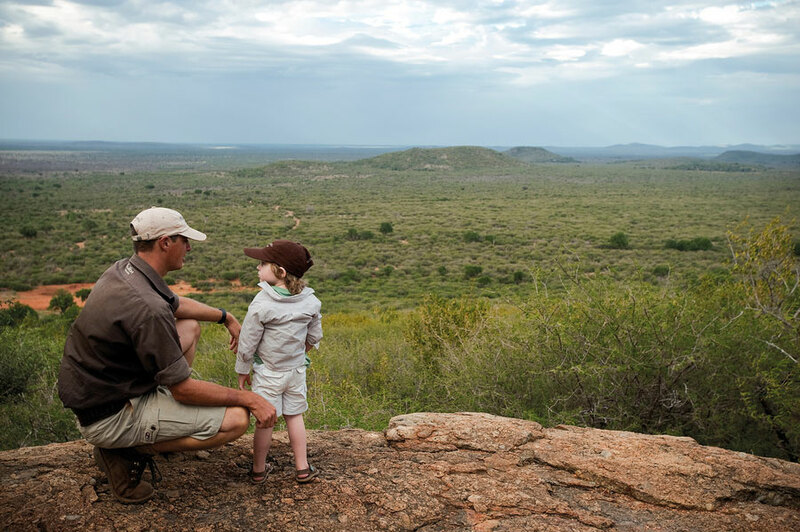 These usually involve a variety of activities and “mini-safaris,” introducing kids to the bush in a safe and regulated way. Some lodges also do not accept children younger than certain ages (12 and 16 in some cases), so research is crucial before you get your heart set on a particular lodge. Taking young children to a lodge that is mostly frequented by adults and couples only can end up being disruptive to you and other guests, and could potentially mean a lot more stress than is necessary on holiday. 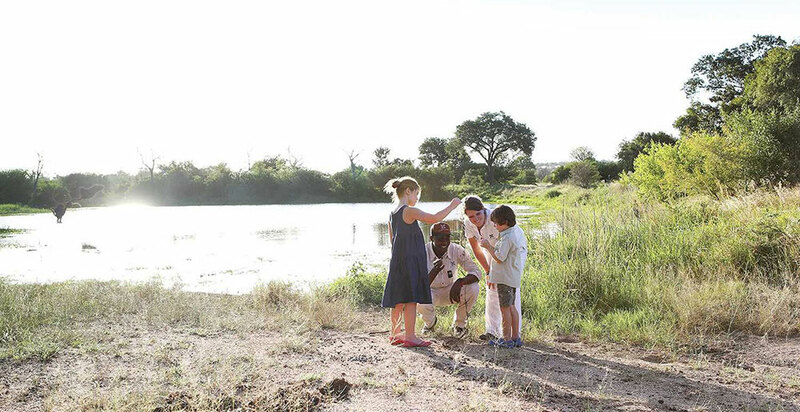 Most lodges won’t allow children younger than 6 or 7 on game drives, both for safety and disruption factors. You may be able to book a private safari vehicle for you and your family, but be sure to check with your lodge that they offer this service. Another reason to take kids younger than 6 to a lodge that has a kids club! Safety on safari cannot be overstated. It important to remind children that you’re not in a zoo, but in a wild environment with animals that are unpredictable. Don’t get out of the vehicle under any circumstance, unless sanctioned by the ranger. Keep your children close and keep them sitting – standing up in open-topped cars is always prohibited in game reserves. Health-wise, your most significant risk on safari (in most places) is malaria. You can take preventative medication of course, but if you wish to avoid the risk entirely, and especially if you are traveling with very young children, visit one of South Africa’s top malaria-free reserves. If you are keen on places like Kruger, Sabi Sand or the Timbavati in South Africa or the Masai Mara in Kenya, consider visiting during winters when malaria risk is at its lowest. Either way, if you are traveling to an area in the malaria belt, the preventative medication must be taken before you leave for your trip, and if you or your kids have any sign of fever in the months after you return, see a doctor immediately. Children may be excited by the idea of safari, but remember that the reality includes a lot of waiting around with little activity. Tracking animals in large parks and reserves means that there will be periods where there are no animals to be seen, and your children may become bored and potentially disruptive. Be sure to manage the children’s expectations as some patience is required. It is best to include something to keep them occupied while in the vehicle. This can consist of coloring books, cameras, and checklists for animals. Some lodges will have specific programmes for children and will provide activity books. Allowing your kids to have a camera or camcorder (consider disposables if you’re worried about accidents) will also help them pass the time and focus on what’s happening around them. Allow enough rest time – safaris involve very early wake-ups and long drives, which can result in grumpy children. Give them the option of downtime in between rides, and if they fall asleep in the vehicle let them doze a little. You can always wake them up when that pride of lions comes around. Most lodges offer two game drives per day, but it may be a good idea to keep it to 1 if you want to avoid both early mornings and late nights with young children. To the best of your ability, try to keep kids as quiet as possible – animals will be startled by loud noises (not to mention it won’t please other guests either). So in choosing to take your children on safari, you have to consider your child’s personality – if you know your child is prone to yelling or tantrums, reconsider taking them on safari until they are older – or take them to lodges with kids clubs where they will be catered for while you enjoy game drives with your fellow adults. If you intend to travel into or out of South Africa for a safari after June 1st, 2015, remember that a new law has come into effect regarding travel with children under the age of 18. All kids must have their unabridged (long-form) birth certificates along with their passports, so apply for this in good time if you do not already possess it. An unabridged birth certificate shows the details of both parents – names, ID numbers, birthplaces, and birthdates. This law has been enacted to help combat child trafficking and will be enforced across all ports of entry. Hi Jeff, thanks a lot for this post. Useful tips and tricks. I just hope you are wrong with advising not to go to Okavango Delta for safari with kids, as we go there this August :). I do hope it will be the highlight of the vacations… Fortunately, my boys are 11 and 14.